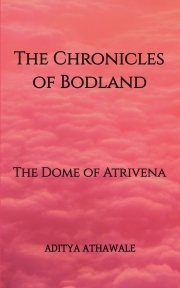 Description of "The Chronicles of Bodland: The Dome of Atrivena"
The rapidly developing and expanding kingdom of Bodland thrives, but so do the rumours about secret supernatural forces keeping it all in order. Is that a possibility? Does Bodland really have a mind of its own? What, exactly do the citizens talk about when they refer to Bodland's 'spirit'? The answer to all these questions lies somewhere deep inside the chambers of the mystical Dome of Atrivena, where a group of ambitious citizens wish to go and unravel the mystery once and for all. Are they really meant to discover it, or is it just their mind playing tricks? Aditya Athawale is a young fiction writer who loves to play with abstract ideas and complex realities and create stories which are based in them. Aditya also loves to dabble in Astronomy and Philosophy. Reviews of "The Chronicles of Bodland: The Dome of Atrivena"